The Signature-Secret Notes & Photos iPhone and iPod Touch app is a secret journal to tuck away notes and photos with a gesture controlled password. The secrets are hidden by a public interface that serves as a decoy. When you make the correct gesture on the decoy screen, the public interface dissolves to a new interface with your secret information. 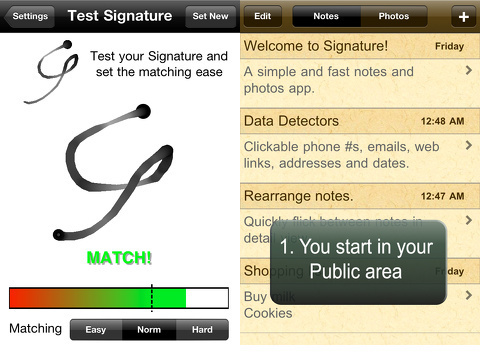 To get started with the Signature-Secret Notes & Photos iPhone app, you establish your gesture controlled passcode. You can use the default gesture control, but it would certainly make sense to establish your own. The screen is empty, and you run your finger on the screen. The passcode is evaluated as easy, normal, or hard. You can add a numerical passcode that will work, if you forget your gesture. The gesture controlled passcode assesses the time and movement of a gesture to determine accuracy. The screen to create and add secret notes and photos is simple. The top menu bar allows one touch sorting of notes and photos, as well as the chance to edit and add items. You touch the plus icon to add a note. The interface is just a keyboard and blank space. You add the information, and it is saved and stamped with date and time. You can copy the note and move it to the public decoy screen. Or, you can share by email or SMS text. You can add a photo by shooting one from the in-app camera or selecting one from your iPhone library. If you shoot one from within the Signature-Secret Notes & Photos iPhone app camera, it will not be saved to your iPhone photo galleries. The edit tool simply deletes unwanted items. 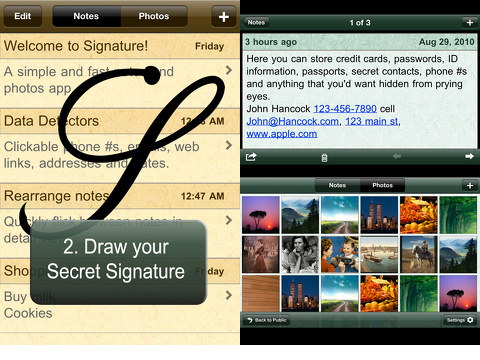 The Signature-Secret Notes & Photos iPhone app is a free download from the iTunes App Store. You can save three notes and three photos with the free download. In order to save more, you can buy the unlimited package for $1.99. The Signature-Secret Notes & Photos iPhone app’s use of gesture controls is effective and interesting. The interface could use some attention to sharpen the graphics and add more sophisticated interface to increase its appeal. There is just nothing to grab and engage you beyond the cool, gesture controlled passcode. AppSafari review of Signature-Secret Notes & Photos was written by Jenni Ward on March 12th, 2013 and categorized under App Store, Free, Photos, Utilities. Page viewed 4799 times, 1 so far today. Need help on using these apps? Please read the Help Page.